What is transitional style when used in interior design? The answer is in the name, transition. We all know transition, we spend much of our twenties in a transitional state. And for most of us, we prefer transitional design, even if we aren’t aware that is what we are seeing. Transitional design has one foot firmly planted in traditional design and the other in more contemporary digs. One of the best aspects of transitional design is how well it ages. A transitional interior design creates a cohesive look by perfectly combining traditional and contemporary in to one. Since this interpretation can be different for each person, it can be a little problematic to put your finger on exactly what makes the style what it is. You can keep your traditional pieces and update the rest of the room as trends change in contemporary design. For many this means updating your furniture, fabrics and finishes as design trends change over time while keeping some of the traditional elements that provide a lot of character to the space. Transitional design is timeless, looks effortless, and is comfortable. Mixing two opposing designs can be a challenge, but with some pro-tips, you can have the transitional home of your dreams. Cabinets can really set the tone in transitional kitchens. 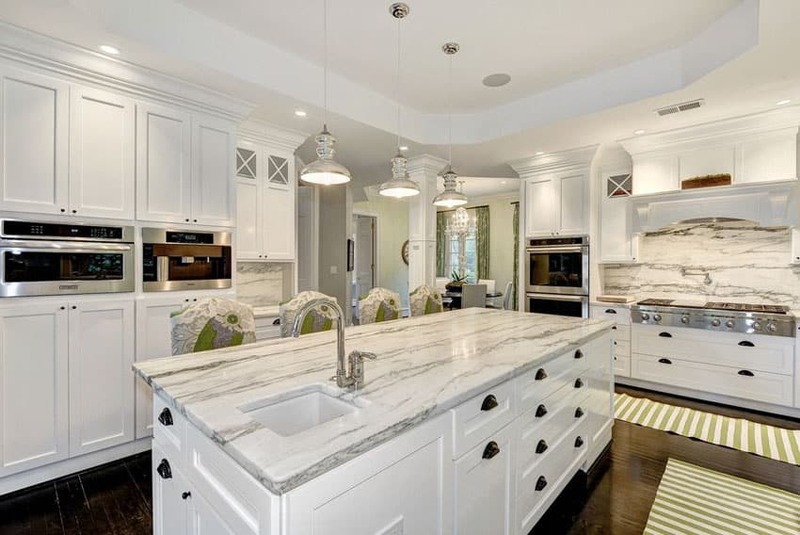 White-painted cabinetry leans traditional, just keep the cabinets simple, no fancy mill-work, and use contemporary, minimally styled hardware to give it an updated look. Traditional stone countertops marry well with the strong, clean lines of modern stainless appliances. Warm wood floors or oversized stone tiles carry the traditional look onto the floor and subway tiles or mosaic tiles in muted colors as the backsplash keep it contemporary and light. A laminated kitchen island brings in more strong, clean lines and gives the space a fresh, modern feel. If you have traditional wood cabinetry and you don’t want to change it, bring in lava stone or steel countertops as your modern components. Add glass pendant lights above your island and hidden under-cabinet task lighting to give your kitchen a fresh, bright look. Keep accessories simple, a favorite ceramic bowl full of fruit, or a tall glass vase with fresh flowers are all you need to bring in color. Speaking of color, keep your palette neutral, greys, oatmeal, and almonds are the perfect backgrounds for the transitional home. Take a look at our collection of transitional kitchen designs here. The key here is to stay neutral, incorporate texture, use art for impact, and keep your accessories simple and minimal. Editing what you already own can get you on your way to a great transitional space. In lieu of a gallery wall, reduce it down to just one great piece, simply matted in a neutral color and framed in wood. If you are a collector, reduce your collection to just one fabulous piece. You needn’t toss the rest in the rubbish bin, just move it to another space or stash it away in storage. Just like in the kitchen, you don’t want items that are ornate or fussy, so keep your furnishings simple, the strong lines and gentle curves with play with one another, gracefully mixing the masculine and feminine. Think of a modern take on a wingback chair upholstered in a beautiful, muted traditional ikat fabric. Add a contemporary sofa covered in a lovely, oatmeal-colored chenille and you have the start of a great transitional room. 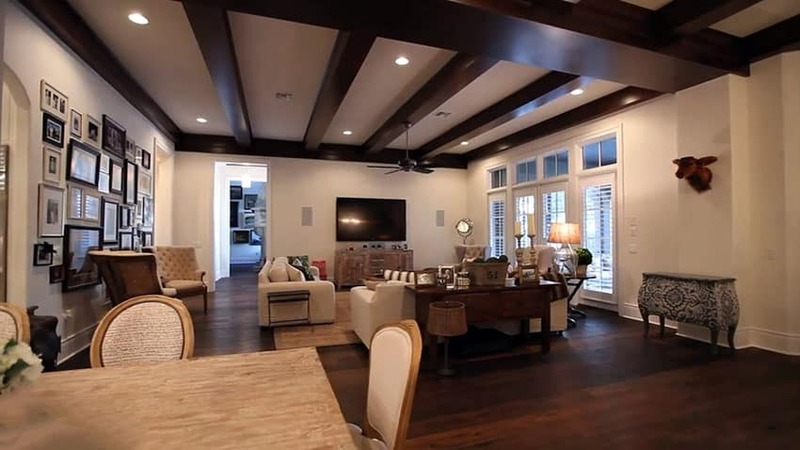 The dark wood floors and makes an impressive contrast against the classic white wainscoting and box ceiling in the bright living room shown above. Beautiful hardwood floors in the living room can really make a room stand out and help establish a transitional design element when paired with present-day furniture pieces. To help capture the transitional style in your living room keep your window coverings minimal. For window treatments Roman shades or bamboo blinds topped with simple panels in linen or bark cloth in the same monochromatic scheme as the wall color and upholstery, add textural interest. You want your furnishings to be comfortable and inviting, this is a space that should feel casual but not sloppy, put together but not stiff or formal. Bring in natural elements, comfortable furnishings, strong, clean lines in your case goods such as bookshelves and tv benches, edit your accessories, and stay with a neutral palate. If you remember these great tips, you will have classy, relaxed transitional design. The transitional bathroom is inviting, relaxing, and peaceful. Spa-like in its simplicity, with the warmth of traditional pieces and strong lines of modern materials creating a serene harmony. Let the floor be your background, quietly setting the tone for the room. Color matters here, so if you are using stone or ceramic, keep it neutral, laying the tiles in a chevron pattern or at an angle to create a diamond pattern can add a bit of texture without making the floor stand out. Reclaimed teak or other rich hardwoods are a great choice for the transitional bathroom, check with your flooring expert to ensure that they are appropriate for wet spaces before installing them. Keep your wall color neutral, in the same color family as your floor tiles, if you’ve used tiles. You can even carry the tiles up the wall, giving a traditional material a modern treatment. 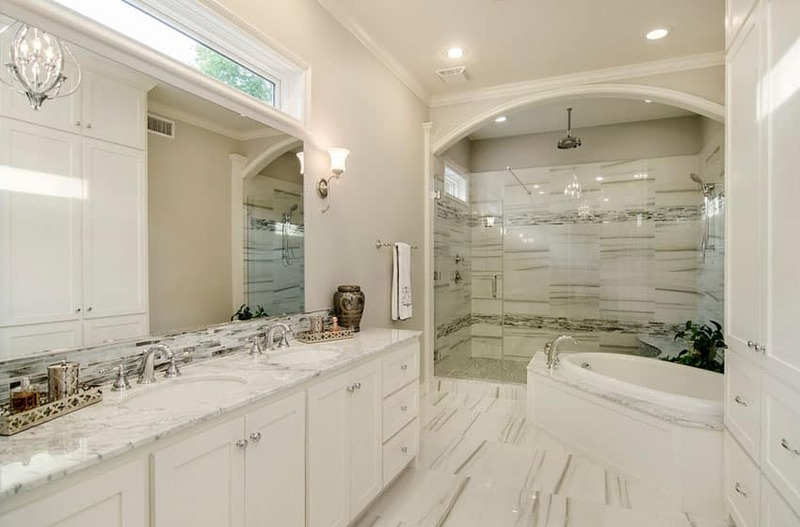 If your flooring and cabinetry are traditional and you don’t want to change them, update your space with a modern slipper tub, sparkling and simple hardware and faucets, and a seamless glass shower door. If your flooring and cabinetry lean modern, offset it with a clawfoot tub, either antique or reproduction. A favorite look among designers is to use traditional wood cabinetry in a modern way. A low cabinet the spans one whole wall, topped with a gleaming white stone counter and glass bowl sinks. Below the sinks are cabinets, flanked by drawers, and in the center, open shelving on which to store a pile of luxurious, white towels. Sparkling clear blown glass pendants mounted above each sink and an antique chandelier above the bathtub bring a bit of understated luxury to the space. In mixing masculine and feminine elements, you achieve an extraordinary sense of balance. A transitional bedroom design can utilize traditional elements such as wainscoting, picture windows, rich hardwood flooring and combine them with contemporary furnishing and decor with great results. The room design show above incorporates old and new furniture pieces together to create a beautiful bedroom. 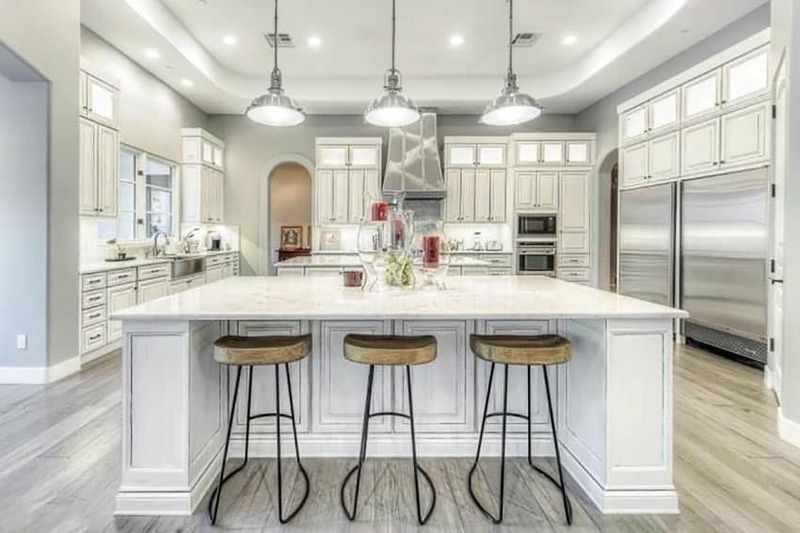 If you have always loved traditional style but felt it was a bit dated or stale, or if you have yearned for the clean contemporary style without the cold sparseness, transitional design is for you. Blending the two styles may seem challenging, but it is certainly attainable! Just remember these key tips, stay neutral with your color palette, think easy, muted, calming colors. Edit your accessories, use one fantastic piece of art that has impact, ditch the dust-collectors, don’t create visual clutter. Use furnishings with strong, clean lines, no scrollwork or baroque bits here, keep it simple, keep in comfortable. Incorporate texture, nubby textiles, wood, sisal rugs, woven reeds, smooth glass, keep the colors monochromatic but vary the texture for interest. You want to create a peaceful, inviting, relaxing, calming space. Casual and comfortable, traditional and clean, equal parts masculine and feminine, hard lines and graceful curves. Transitional style is timeless, ageless, allowing you to update your style as trends change without dating your look.